Who Can Benefit From Our Training Classes? Are you new to SEO/WordPress? Are you confused and even a little intimidated with the SEO/WordPress Content Management System? Then Live Training is perfect for you. You can ask all your questions and quickly learn the basics and more. 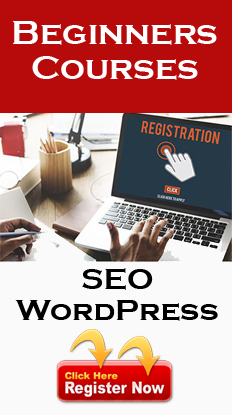 Do you want to build and edit WordPress websites that rank high in the search engines? Do you want to “do it yourself” and save money? With our Live Online Training we will answer all your questions about SEO and show you how easy it is to customize your web pages. Do you need to quickly learn how to add content, edit pages and create a “sophisticated” look for your company’s outdated website? With Live Training you will quickly learn the skills it takes to manage a beautiful, modern SEO/WordPress website. Do you need Basic to Advanced SEO/WordPress training solutions for your staff? The SEO/WordPress Learning Center can provide remote or on-site training packages customized to your training goals. Over 25% of all websites in the world have been built on the WordPress content management system. It’s a very flexible platform that can give you an endless variety of looks and functionality. This means you can make it do exactly what you want and look exactly how you want. However, with that flexibility comes a somewhat more complicated interface than most of the “drag-and-drop” web platforms, and it can be overwhelming to try to just “figure it out”. This course is designed for the beginner who wants to learn how to easily manage and have full admin control of website or blog. Your customized website should be designed and built out with the proper content so it works as a marketing platform for your business. If you’d like to manage your own website without learning code, this class is designed for you. During this live gotoMeeting class, you will learn basics of WordPress. If you have a WordPress site this class is perfect for you. If you are thinking about having a WordPress built, this class is a great way to start learning how to manage your site. In order to participate in the class, you’ll need to know how to use a computer with a web browser. You need a desktop or laptop computer. You will need to have paid for the online class. You do not need to know any HTML, coding or programming. This is designed for any WordPress site owners who want to learn how to build and manage their own website. The live virtual training is a class that is limited to 150 people per class that will take place over 1 hour and is scheduled Mondays, Wednesdays and Fridays. We use gotoMeeting, and you’ll need to install a small free app on your computer before joining. Get free APP here. You do not need to have an account with gotoMeeting in order to participate. Note: You may not share your login information or the recordings with anyone else. The rules of SEO/SEM have changed and are constantly changing. A potential buyer – our clients – have become more sophisticated. They’re skeptical of marketing hype and have no patience. They’re digitally and socially connected on a variety of devices. We have to attract our ideal customers and clients online so they get to know, like and trust us before they’ll consider doing business with us. The important metric is no longer traffic, but conversions. We have to attract, segment and convert anonymous visitors into warm, qualified leads. During this course, you’ll learn the basics of digital marketing system to attract, nurture and convert leads into your sales funnel. You’ll walk away with a plan that you can implement right away in your own business. At the end of this course, you’ll have a solid knowledge of Search Engine Optimization for your business without spending a lot of time or money. You’ll have the steps to take to help attract your ideal customer, build trust and rapport with them, so they engage directly with you on your terms. They will transform from anonymous visitors into warm leads that can lead to new business for you. Note: You will need to put some up-front effort into the “homework” to get things working correctly for you, but you need it so your system will run efficiently and not require a lot of upkeep to continue to generating results. You do not need to know any HTML, coding or programming. This is designed for business owners who want to learn how to build and manage their own website. The live virtual training is a class that is limited to 150 people per class that will take place over 1 hour and is scheduled Tuesdays and Thursdays. We use gotoMeeting, and you’ll need to install a small app on your computer before joining. Get free APP here.